The selection of a stroller for a baby is a serious task that falls on the shoulders of parents. Choose a good stroller among a diverse range of models is quite difficult. Most often, parents buy a stroller-transformer. It is comfortable, functional and compact. But how to house them, many do not know. Read the instructions stroller in the store, check the kit foot brake. Buying a stroller for a child with a closed body, consider the springs. As a rule, they must provide a wheelchair glide and to be soft enough. Get the model which is made of breathable and impermeable to water material. Put the seat back horizontally, dropping it. You then need to fold the hood of the stroller and change the handle position so that she was behind the hood. With both sides under the armrests should be the clips. They need to raise up, the carriage was down and had a narrow compact form. And carry the stroller in the Elevator, car, public transport. It is possible to store in the apartment as it takes up little space, can be in the hallway or even on the balcony. Often there is a need for removing the wheels. Remove the wheels quickly and easily without using a wrench or a screwdriver. Click on the wheel axle in the centre, which is visible from the outside, and then pull it. Similarly remove the second. Install them back on the Central axis by the same method. To do this, hold the button and put the wheel on the old place, so it locks into place. The unfolding of the stroller and removing the wheels takes no more than fifteen minutes. Quality durable stroller has a folding mechanism. Laying out your stroller, let's see, how does the wheel lock, because this will depend on how you raise this subject on the stairs. 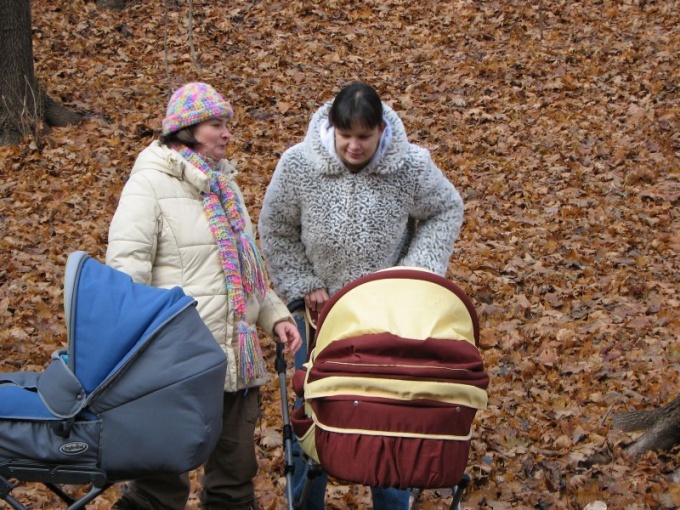 Pay attention to the weight of the stroller, so as to move it will have to quite often. Some models have a carrier, and the most comfortable and convenient cradle. It is mounted on the chassis or in place of the seat unit.